We are often complimented at St.Mary's on the warmth of our welcome to all who worship here as well as to those who come to find peace and quiet or to simply pop in for a visit. Our Sunday services vary from the traditional Morning Prayer following the Book of Common Prayer on one Sunday a month, to our informal Family Service also once a month. On the other two Sundays we celebrate the Eucharist following Common Worship. Our non-Eucharist services are often led by a member of our local team of lay leaders and our children take an active part in our Family Services. Through the year we try to reach beyond our regular worshippers to others in our community. Towards the end of July we celebrate our enviable situation with our Sea Service which is wonderfully supported by our fishing families as well as by the many who have retired here or who come on holiday to enjoy sailing from the harbour or playing on the beach. Our Harvest Festival gives an opportunity not only to thank God for his bounty but also the many who serve others in our villages. At Christmas last year our Christingle Service enabled us to involve many children from the village school. In recent years we have restored our beautiful medieval glass, re-felted and re-leaded our chancel roof, updated our sound system and completely overhauled our organ. This church has served the tiny coastal village of Burnham Deepdale since, it is believed, the 11th century.However, although originally thought to be Saxon in origin, the round tower shows a mixture of influences and is now thought likely to have been built after 1066 using the traditional techniques which survived the Norman invasion. The Round Tower has a triangular headed doorway on the first stage above the tower arch inside the church that shows this mixture of influences. A special feature is that the base of the tower is 6 inches thicker up to a height of 10 feet. The coursing of the flints does not have the appearance of Saxon work. A unique feature of East Anglia, there are 175 round towers still surviving from an original 1000. 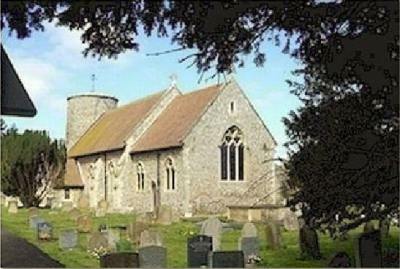 St Mary's is one of a group of three in the adjacent parishes of Titchwell, Burnham Norton and Burnham Deepdale. They were either part of the church or built as an addition. The tower houses a bell to summon the parishioners to church. The bell in St. Mary's was made in the 14th century by M. Derby of King's Lynn. It has, in the past, been considered that square towers were too difficult to build with the available materials of flint and conglomerate, but that has proved false and it is more likely that the building of a round tower had a cultural significance. An outstanding feature in the church is The Norman Font which stands just inside the door on the south side of the nave. In 1797 it was broken while being moved from the north aisle and was taken to Fincham Rectory for repair. It stayed there in the garden of the Rectory for forty years before it was finally restored and placed in its present position. The Norman font is made of Barnack stone from Rutland and is of special interest because twelve of its carvings shows a calendar of work for the farming year. You can find more information and pictures at The Norman Font at Burnham Deepdale. There is a rich and varied collection of Medieval glass in the church. The west window of the north aisle shows God holding Jesus on the cross and the west window of the tower has a lovely picture of an angel pulling triple chains attached to a censer above and in the lower half, there is Mary Magdalene in a pink robe with a gold border holding a scroll. Two windows in the vestry are filled with medieval fragments. A square low-side window behind the pulpit is surrounded by early bricks; it has a deep red cross within a circle. The porch windows are known as the Sun and Moon and these windows are filled with assorted fragments including the words "Death is thy sting"
St. Mary's at Burnham Deepdale is part of a Trail around four round towered churches in north-west Norfolk. This trail is one of a set of four which invites you to explore different parts of the Norfolk countryside in search of round towered churches and their links with the North Sea Viking Legacy. See the The Viking Legacy page and pick up a booklet from Burnham Deepdale, Burnham Norton, Shereford or Little Snoring and claim your gold coin. See also the official Round Tower Churches Society web site and learn more of the village from www.burnhamdeepdale.co.uk. Sources: Church Tours Committee 1984 and Round Towered Churches in Norfolk, 2001.